Some years are just harder than others. As I sit here this dark early winter evening waiting for the clock to chime midnight and usher in the new year on the calendar I can’t help but look back on 2010 and weep. The year began with the passing of one of my long-time educational animals; a little black squirrel named Johnny. Hit by a car and permanently disabled at 8 months old, what started out as quite a determined, single-minded effort on his part to see how many times he could bite me in short order ended up becoming a truly delightful relationship that lasted almost 9 years before bladder cancer brought it to its inevitable end. At the same time, another educational squirrel named Cleo came close to losing a leg and her life from what was apparently a spider bite. Months of ’round-the-clock care combined with her cooperative nature and will to live saved her. For the third time. There were other losses as well; each the unfortunate normal reality of working with wildlife. Then came the midterm elections and I took on the assignment of campaign photographer for one of our Congressional candidates but come the closing of the polls on November 2nd, there was yet another loss. But through all of this there was the bright spot of a squirrel at the kitchen window almost every day. The inimitable Eleanor continued to visit regularly, as she had been doing for almost 9 years. Every visit warmed my heart and, realizing how long she’d been coming around, I had begun watching her closely for the signs of her advancing age were beginning to show. As November rolled in, bringing its chilling portents of winter, it seemed that my beloved Eleanor wasn’t putting on weight as were the other backyard visitors who seemed to have sucked the air hose overnight. So I kept an eye out for her, offering those things she loved the most and encouraging her to stay and eat her fill; shooing away the others who observantly would learn to follow her lead and steal her goodies off the windowsill. The middle weekend of November was insanely busy; I was working long hours for a fundraiser that started late each afternoon and as I rushed around each day getting ready, I noticed that Eleanor had begun to show up in the middle of the afternoon instead of first thing in the morning. Hearing the little scratching sound as she jumped onto the windowsill or the more determined sound of her climbing the screen to better peer inside to see if I was sitting here, I would promptly grab her goodies and fling open the window, watching with amusement as she poked her head inside and stamped her little hind feet as if to demonstrate her impatience with having had to wait to eat. The following week I noticed Eleanor was coming neither in the morning nor in the midde of the afternoon. It is not unusual for a regular to go MIA for a few days so I tried not to worry but the days became weeks and now the weeks have become months and I must acknowledge the cold, hard truth that my beloved friend, the last of my original “porch pals” and the last reminder of my starting down this road filled with furballs isn’t coming back. For a while and still occasionally when feeding out back I call her but the silence continues to mock. Eleanor was very old for a city squirrel; certainly testament to her savviness but heartbreaking for the human who had come to cherish our unusual little rituals and her unique little habits. I still start at the sound of scratching on the kitchen windowsill. I probably always will. I was a photographer before I became a wildlife rehabilitator. Yet it was becoming a wildlife rehabilitator that pushed my photography to the prominent level in my life at which it exists today. I suppose you could say that in more than one way it started small, documenting all the tiny, precious lives that came through my door. As they grew up and moved out, it naturally expanded to documenting the rest of the world, with an emphasis on wildlife and nature. 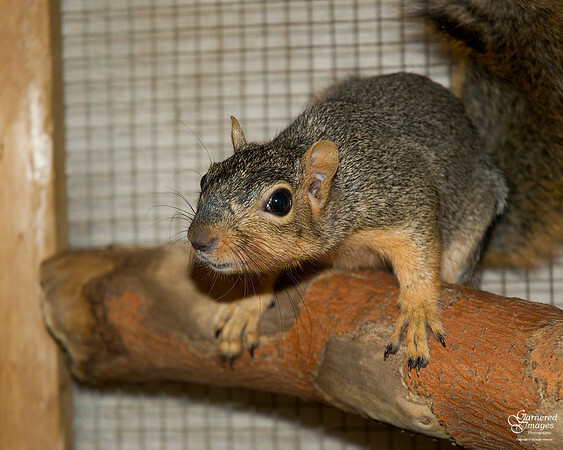 The wildlife rehabilitation is recorded at A Squirrel’s Tale, where such things belong, yet this is a case where I would be remiss to not write about it here. For as it always goes, there has come a point in time where life has come full circle. Nine years ago I found a baby squirrel who ended up not being releaseable. She was also my most beloved familiar, something that was immediately obvious to her but took me time to fully understand. She grew up in front of my camera’s lens; a small, fur-covered ham perfectly at ease in the spotlight, and perfectly comfortable with her role as an ambassador for wildlife and wildlife rehabilitation. When she died of cancer last summer, in one entirely too-small and therefore woefully inadequate word, I was devastated. It is impossible to describe the aching emptiness that still exists inside of me and I suppose my reaction to it was the same as most who have suffered a similar loss – I ignored it. For months I simply avoided her cage, never cleaning it out, really not even looking it at. I have always known and always trusted that Time is a healer and so it was that as the months have passed it did become easier to bear the dreadful change in routine, the choking silence that replaced Sunny’s merry little grunty-oofing calls and the singular sounds of her climbing around inside her cage that used to emanate from the corner of the dining room. And the fall babies grew up, necessitating the requisite shuffling as they were moved into bigger pens for the winter and thereby bringing a semblance of normalcy back to the house. This left only little George Staples in a big cage that still sat in a temporary spot and the 3 “mini” fox squirrels who needed to be moved into a big cage to overwinter indoors. In my heart of hearts, I knew what needed to be done next but it took a while to actually force my Self to do it. I cried as I removed Sunny’s long-empty food dish from her cage, then again when I took out her bed. There were more tears as I cleaned her cage thoroughly and set it up for its new resident. George Staples would be the lucky recipient of Sunny’s “prime location” for the educational animals here and I was both surprised and my intuitive decision confirmed when he took to his new digs without the slightest bit of concern or fuss that is normal for ever-status-quo-preferring squirrels. Indeed, it is as if he belongs there in the same way that Sunny did; he is utterly content and his behaviors are as if this had been his post-weaning home all along. The adjustment has been harder for me. As George scrambled around the cage exploring that first evening, the comfortingly familiar sound that has gone unheard for 5 and a half months shot through my heart like an arrow. There was a fleeting sense of time folding back upon itself, yet an intellectual pang that such a thing is not possible. I was not going to turn around and see Sunny’s beloved little face grinning at me and while George Staples is a “talker”, it isn’t his way to vocally beg for anything the way that Sunny always did. I pulled out the camera to record this momentous day in George’s life, and it was then that thoughts about the circle of life began to bubble up. This was how what is now such a large part of my life began 9 years ago and in its inevitable and inexorable way, yet another new cycle begins again. I can only hope that this next one contains the same enormous quantity of love and joy.